The clubhouse and the shooting ranges are on a forty- acre tract that borders undeveloped Lake Edey. Most visitors are quite surprised when they enter the grounds and see the large log clubhouse that was built by the members. It is a beautiful building, inside and out. 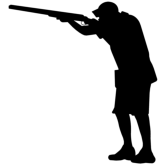 enjoy the growing sport of trap shooting. 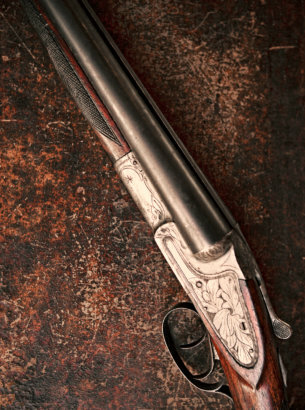 We know that double guns would have dominated the firing line back then, but, of course, the lure of the repeaters, such as the Model 12 and the A5, had an effect on the shooters. STSC sponsors a variety of events throughout the year, and the clubhouse is often rented for a variety of events, including weddings, graduations, hunter safety classes and concealed weapon classes. Want to join the Sagola Township Sportsmen's Club? To join, click here to open the membership application, print out the application, and mail it. 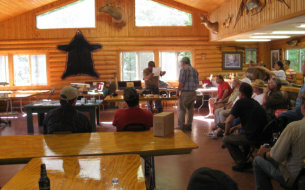 The clubhouse and the shooting ranges are on a forty-acre tract that borders undeveloped Lake Edey. 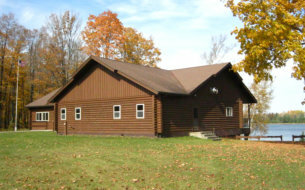 Most visitors are quite surprised when they enter the grounds and see the large log clubhouse that was built by the members. It is a beautiful building, inside and out.